General Warhaft was the general of the Imperial Guard under Emperor Uriel Septim VII, to whom he was both a loyal bodyguard and close friend. Little else is known about the General. He commissioned the writing and publication of the Manuals of Arms and Armor to serve as guides to all officers of the Legion regarding their standard equipment. Welloc was a wizard during the second and third centuries of the Third Era. He was most likely the Archmagister of Skyrim before being appointed by Empress Morihatha to the rarely-filled but powerful position of Imperial Battlemage. Later in the Third Era, an illusionist named Berevar Bero was known to have publicly criticized Welloc, saying that he was "an accomplished diplomat" but not "a powerful student of the School of Destruction". Others vociferously defended Welloc and cited how on one occasion he cast Vampiric Cloud on the rebel army of Blackrose, thereby sapping their strength and skill and giving it to their opponents. Lord Woodborne was a minor noble of Wayrest in the early Fifth Century of the Third Era, and betrothed to Princess Elysana, daughter of King Eadwyre. At some point around the year 3E 400, the Totem of Tiber Septim was found in the Iliac Bay region. Legends held that this artifact—unseen since the end of the Second Era—allowed its bearer to control the equally-legendary Numidium, a colossal brass golem of Dwemer make said to have been used by Tiber Septim to conquer all of Tamriel. It is unclear who found the Totem, but by 3E 403 it had made its way into Lord Woodborne's hands. 3E 403 also saw the conclusion of the War of Betony, a petty land squabble between the kingdoms of Daggerfall and Sentinel that had escalated into an all-out war. 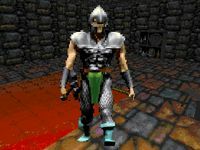 On the eve of what was to be the decisive battle at Cryngaine Field, a delegation from Wayrest—which included Woodborne—visited the Daggerfall contingent to speak with Daggerfall's King Lysandus. During the meeting, Lord Woodborne crept up behind Lysandus and stabbed him. The king died quickly, and his son Gothryd was crowned the new king shortly before leading his troops to victory. In 3E 405, Emperor Uriel Septim VII sent an Agent to the Iliac Bay to investigate the death of King Lysandus. Over time, the trail eventually led to Woodborne Hall in northwestern Wayrest, where the Agent discovered evidence that Woodborne was planning to seize the throne of Wayrest—and presumably use the power of Numidium to conquer the surrounding lands. Lord Woodborne was eventually cornered and slain by the Agent, and with his dying breath revealed his co-conspirator in this sordid affair to be none other than King Gothryd. This page was last modified on 13 July 2014, at 16:02.